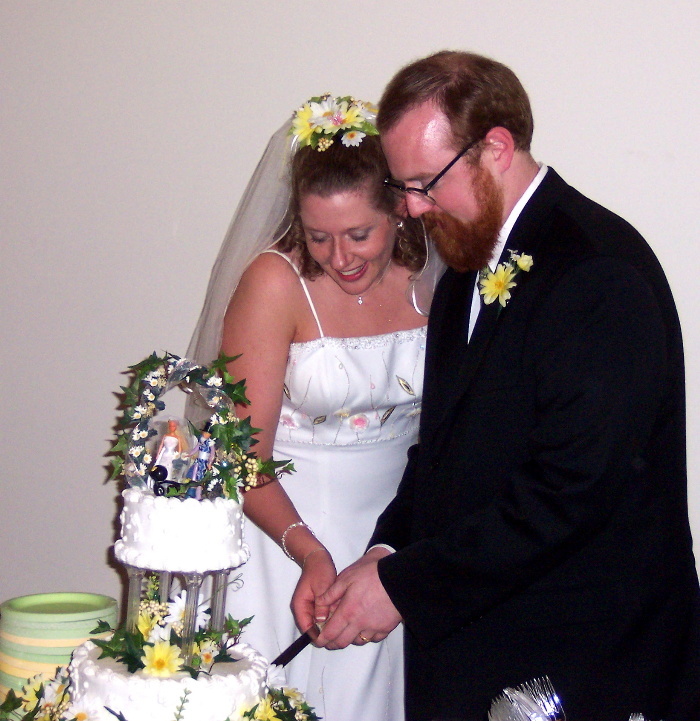 On June 19, 2004 in Grand Forks ND Erin Harmon took Susanne McCulloch to be his lawful wedded wife. A match made in heaven and begun on the Internet. Lots of friends and family were there and many with digital cameras - this is the result. On Friday we had a barbeque for the wedding guests and looked at some gifts..
Also on Friday, preparations for the great event were made. Everybody pitched in. Saturday morning the Bride's party went to the church to further gild the lily. The Groom's group went to the Blue Moose. Tom and Esther hosted brunch for everybody else and we took pictures. Cake and punch and coffee and mints and nuts for all. A lot of smiling people - no one more so than the happy couple! Poetry by the best man - to be added to this page. IT'S TIME TO RUMBLE! The great Getaway. If you don't know why the crossed folding chairs, you do not watch enough professional wrestling. After the main event, there was clean up - chinese food, a tour of the grandest forks and even an outing to the Turtle River mosquito reserve in eastern ND.